At home, the very old man sits by the window and looks out into the woods. It is another new day, of which he has had more than 35,000. Some 35,000 times the sun has come up for him. He likes to say, "I was given a life, and I used it." When the very old man and his wife bought the property near Hamburg in 1949, they left it in its natural state. They built the house in the middle of the land, so that the deer and the foxes, the starlings and the woodpeckers, would still feel at home. The scene is almost Disneyesque, reminiscent of Snow White, the animals coming up close to the house, looking at the very old man sitting inside watching them. It surprises people, how small the house is. After all, the very old man is Max Schmeling, the former heavyweight champion of the world, who is both famous and wealthy. He could live in a mansion. He and Anny never had children, however, and now she is gone. They were married for 54 years, and she has been dead for 14. "I don't need a big villa," Schmeling has said. There is plenty of room for her photographs. In her heyday, she was beautiful. She was Anny Ondra, the movie star. She was beautiful and he was handsome, and the world they lived in was stunningly vivid. His secretary reports that this is what Schmeling says of the past: "I have had a very eventful life. I have been shaped by two world wars, by success and defeat, and by the beautiful times life has to offer. But"—one can hear him sighing here—"I have also suffered deprivation." 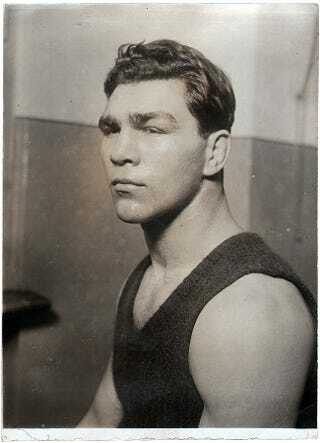 Max Schmeling is not smug. He presents all the contradictions of Everyman, only in him the paradoxes are writ much larger because of who he was and what was going on all around him when he was in his prime.